Here at NuVu Windows limited we offer both chamfered and sculptured windows meaning you can be more unique and make your design more you. We offer Alternate outer frame and Transom/Mullion sizes to fit your needs. We offer in white, wood grain and different colours, these windows are available in a full range of sizes so whatever you need we can provide, frame extensions, sills and ancillaries can be clipped on without any mess or screws. Systems are available in 24,28 and 32mm sealed units, also a 10mm overlap between the frame and sash to improve weather performance. We offer a wider drainage channel which stops residue build up and makes for a more efficient draining system. Tilt and Turn windows which is very different from the traditional casement windows, these are very handy for when it is not suitable for a window to open outwards. It also makes the windows much easier to clean, just turn the handle and the window comes in meaning easier access to the outside window pane. 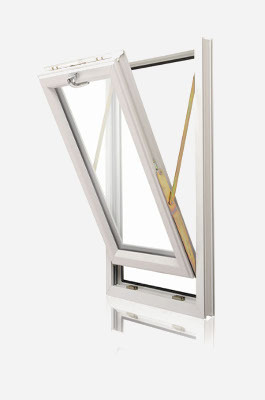 Tilt and Turn windows have top of the range high security locking mechanisms. Two way operation windows, first or tilt position offers ventilation, second or turn position offers easy cleaning. With Tilt and Turn Windows, Outside noise is reduced by up to 30db. Sliding Windows are tradition at its finest. Our Sliding windows have the option of a unique tilt facility making it easier than ever to clean your vertical sliding windows. Our windows are designed to match the traditional aesthetic appeal of a old school sliding window, of course they can include the very traditional Georgian bars for the more authentic look. As always these windows will be designed to your liking and you can have them exactly how you would like them, they come in a full range of sizes, you also have the option of a deep bottom rail. A very popular choice is our reversible windows, they allow maximum light and easy cleaning. These windows are used mainly for child safety as they are fitted with multi positioned child restrictions this is great for a family with small children. At NuVu Our reversible Windows come with a unique twin seal system for weather performance. Book a Free No Obligation Quote call 01604 715116 or email us.